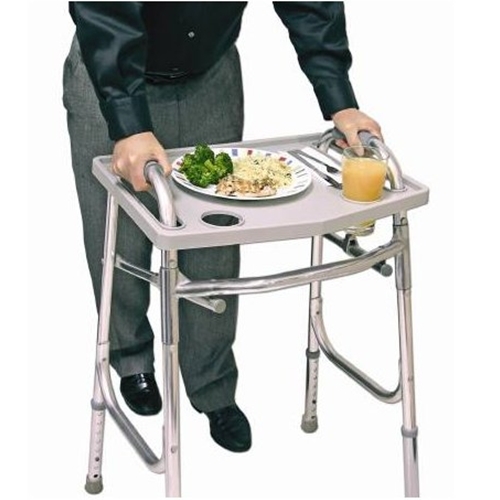 Universal Walker Tray from HealthyKin.com is a plastic tray that slides onto most standard walkers. Holds meals, crafts, reading materials, etc. Serviceable and useful. Had to break out the slots a little larger to slip down over the bars. It's called a Universal Walker Tray, but it does not fit all walkers. I had to return it because it did not fit my mom's walker. She has a regular, grey, hospital issued walker, not tricked out or with fancy handles or breaks and this tray did NOT fit...So there's that. I can now walk and carry my food plate and beverage without problems. Very handy tray. Its not so Universal!! does not fit a standard walker brought home from the hospital. Going to have to return it. what a hassle and frustration, especially after takign a couple of weeks to receive. What a disappointment to make the hadicapped wait that long to get a product that is NOT so UNIVERSAL! It's a basic tray but it's exactly what we were looking for and well worth what it cost. My mother-in-law (84) loves it! company was wonderful. product shipped real fast. Both my parents were very happy with this tray. Great price too! Love it! Not only for "carrying meals" but also laundry, paperwork, and any other thing that you need two hands for.